Che Guevara. Lech Walesa. Abbie Hoffman. What do these men have in common? They were all, in their own ways, revolutionaries. Now we can add Washington Wizards center and undisputed people’s champion JaVale McGee to that esteemed list. What did McGee do now? Oh, not much, just completely changed the way we will look at team defense forever. Just some normal Monday-night stuff. 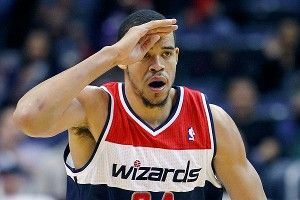 The Wizards were playing the Raptors on Monday night when McGee flipped our world from black and white to Technicolor. Early-ish in the third quarter, McGee went up for a close-range shot, which he missed. The Wizards grabbed the offensive rebound. Then, to paraphrase Kanye West, JaVale McGee didn’t so much graduate as he decided he was finished. He took off down the court, much to the confusion of his teammates, who were trying to run another offensive play. So convincing was McGee’s effort to get back on D, the Raptors’ Amir Johnson went galumphing down the court in tow, assuming his team had possession. Man, what you don’t understand is that JaVale McGee is basically a real-life version of Nicolas Cage’s kid from Knowing (very popular film reference) or the Oracle from The Matrix. Like, he is just seeing things before anyone else does. He contributed something to the present tense, then he just jumped into the future. And the future is where we will be when we finally understand what JaVale McGee has contributed to this game we so love. The McGee Theorem of Early Arrival Defense. That’s the name of the Coaching 101 textbook they will be selling at the John Calipari School for Merino Sweaters and Basketball Philosophy in 2034. Believe that. For full, Zapruder-film-like evidence of all this action, check out Dan Steinberg’s piece over at The Washington Post. Hat tip to Truth About It’s John Townsend for the amazing gif-ery.